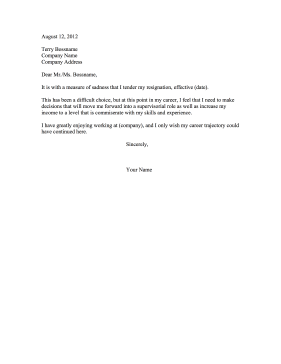 It is with a measure of sadness that I tender my resignation, effective (date). This has been a difficult choice, but at this point in my career, I feel that I need to make decisions that will move me forward into a supervisorial role as well as increase my income to a level that is commiserate with my skills and experience. I have greatly enjoying working at (company), and I only wish my career trajectory could have continued here.